How to refer to PHITS? Please explicitly write the version of PHITS you used, and refer the following document in context of using any version of PHITS. 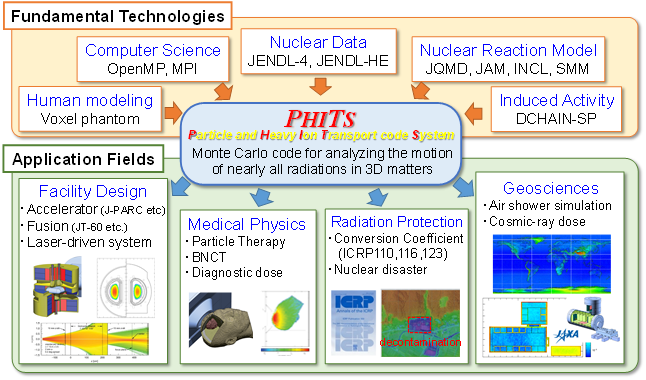 Features of Particle and Heavy Ion Transport code System (PHITS) version 3.02, J. Nucl. Sci. Technol. 55, 684-690 (2018). This is an open access article, and you can download it from here. Please also refer the following about benchmark calculations, when you discuss about the accuracy of PHITS. You can download the latest version of PHITS manual in pdf here. Update log of PHITS manual is here. Update log of PHITS is here. To request for PHITS tutorial, please contact PHITS office. We are waiting for your request!